Moderate moisture to wet. Open woods, thickets, meadows, prairies, roadsides. Full to partial sun. 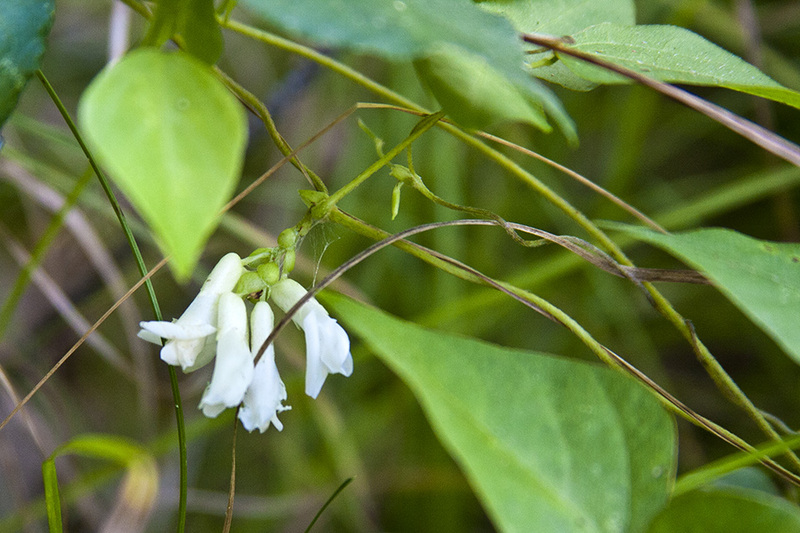 This is a sprawling or climbing, 6″ to 60″ long, herbaceous, annual vine that rises from a taproot. 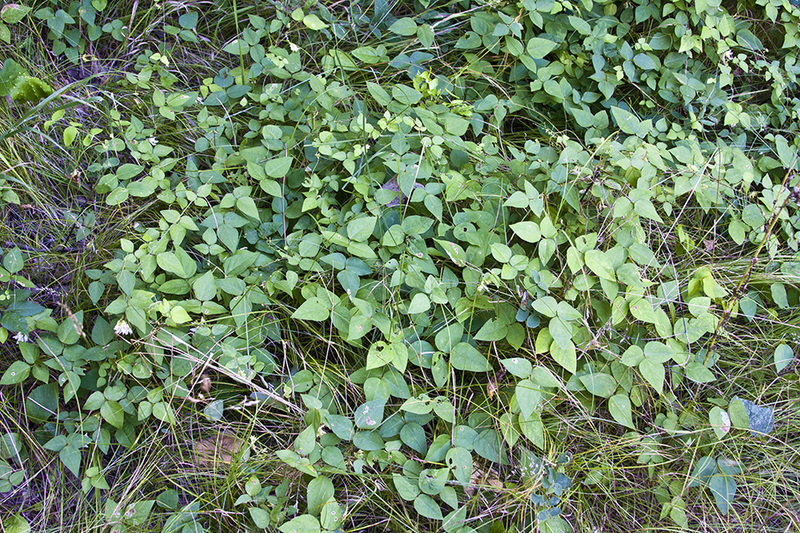 It spreads by producing above-ground or underground creeping runners (stolons). The stem is slender, round, light green to reddish green, and covered with appressed, white hairs. It does not produce tendrils. It climbs by spiraling clockwise at the tip around the stem of another plant (twining). The leaves are alternate and pinnately divided into 3 leaflets. The leaf stalks are slender and ¾″ to 4″ long. At the base of each leaf stalk is a small appendage (stipule) that is egg-shaped or lance-shaped, about ⅛″ wide, and ⅛″ to 3 ⁄16″ long. The leaflet stalks of the two lateral leaflets are no more than ⅛″ long, while that of the terminal leaflet is ¾″ to 1½″ long. At the base of each leaflet stalk is a tiny, secondary stipule (stipel). Each leaflet is broadly lance egg-shaped or diamond egg-shaped, 1″ to 2½″ long, and ¾″ to 2¾″ wide. The blade tapers to a point at the tip and is broadly rounded, broadly angled or almost straight across, and often uneven at the base. The upper and lower surfaces are hairless or covered with appressed hairs. The margins are untoothed. There are two types of inflorescences. One type is a conspicuous, unbranched, elongated cluster (raceme) of 1 to 17 flowers droops from many of the leaf axils at the end of a ½″ to 2½″ long stalk. The racemes are crowded and are up to 2″ long. Individual flowers are on short stalks that are subtended by a pair of conspicuous bracts. Each flower in the raceme is ½″ to ¾″ long. At the base of the flower there are 5 light green sepals. The sepals are united for most of their length into a tube then divided into 4 lance-shaped or triangular, 1 ⁄32″ to 1 ⁄16″ long lobes. There are 5 pale purple to whitish petals. 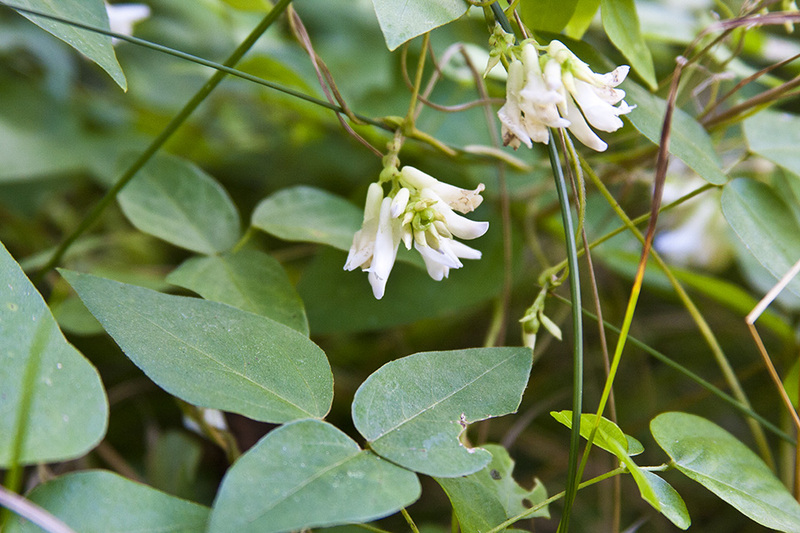 The petals form a butterfly-like corolla, as is typical of plants in the Pea family. They are organized into a broad banner petal at the top, two narrow, lateral, wing petals, and between the wings two petals fused into a keel. The keel is longer than the wings and is curved upward. The banner is upright, notched at the tip, and folded back along the edges. The other inflorescence type is self-pollinating, closed flowers produced on stolons near the ground level. These flowers have no petals and are inconspicuous. The produce seed pods that are buried in the ground. The aerial fruit (produced from the open flowers) is a pod with 1 to 4 seeds. It is not edible. The pod is ⅝″ to 1½″ long and flattened. There is a short, curved tip (beak) at the end of the pod. The seeds are kidney-shaped and brown. The buried fruit (produced from the closed flowers) is a pod with a single seed. The pod is round, fleshy, and ¼″ to ½″ in diameter. It is edible if cooked. The seed weighs 16 times more than the seed of the aerial pod. American hog peanut (Amphicarpaea bracteata var. comosa) stem is covered with spreading, tawny hairs, not appressed, white hairs. The leaflets are up to 4″ long. A small, secondary, stipule-like appendage found at the base of a leaflet stalk.